The 12-Volt Battery Monitor that does it all. With this lighter socket battery monitor you can quickly and easily check the condition of your battery, and the performance of the vehicle's charging system. This battery tester is small, lightweight and pretty darn accurate. There are six (6) LED indicators which are clearly labeled to help you quickly and accurately determine the health of your vehicle's 12V battery and charging system. 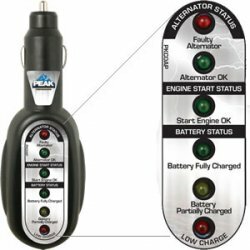 Indicator steps are as follows: Faulty Alternator, Alternator OK, Start Engine Ok, Battery Fully Charged, Battery Partially Charged and Low Charge. This battery tester is a great piece of equipment to have around. As soon as it came in the mail I tested all of our vehicles. The family driver said bad alternator. I took the car to NAPA ( I didn't tell them about my tester) and they confirmed the alternator was about to go out. This product probably save my wife and kids from being stranded with a broke down car. I love it!